COL D’IZOARD, France — French rider Warren Barguil triumphed on the barren slopes of the fearsome Col d’Izoard climb, winning his second stage of the 104th Tour de France while Chris Froome successfully defended his overall race lead on Thursday. Froome lost a handful of seconds to French rider Romain Bardet, who moved up to second in the overall standings, relegating Rigoberto Uran of Colombia to third. But Froome still leads Bardet by 23 seconds, a margin that the French rider will find hard to close now that the Tour is heading out of the Alps. The last opportunity is in a time trial Saturday, but Froome excels at that discipline. Barguil set off in search of the stage victory when there were still 4 miles left to climb to the top of the Izoard pass, a moonscape of scree and rockslides in thinning air at an altitude of 7,743 feet. He sped away from Froome’s group and gradually reeled in riders ahead of him on the climb — the last being John Darwin Atapuma of Colombia, with about 1 mile left to ascend. From there, Barguil labored on alone to win the first stage to finish at the summit of Izoard in the 114-year history of the Tour. Only the hardiest pines survive at such high altitudes. And only the hardiest riders, too. The climb showed again what was already becoming apparent on the first day of Alpine climbing on Wednesday: that Froome is super-strong and only Uran and Bardet are capable of staying with him. They are now the only riders within a minute of Froome overall, after Italian Fabio Aru faded again and continued his slide down the overall rankings. Going into the Alps, Aru was second overall, breathing down Froome’s neck. He is now fifth overall, nearly two minutes behind Froome. 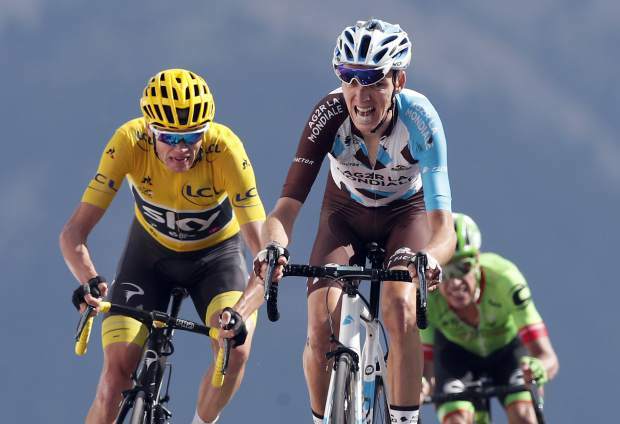 Bardet outsprinted Froome in the final ramp of the climb, and got four bonus seconds for finishing the stage in third place — behind Barguil and Atapuma. As a consequence, Bardet moved a tiny bit closer to Froome overall, having been 27 seconds behind him at the start of the stage in Briancon. Uran lost a couple of seconds at the top, and is now 29 seconds back from Froome in third place.